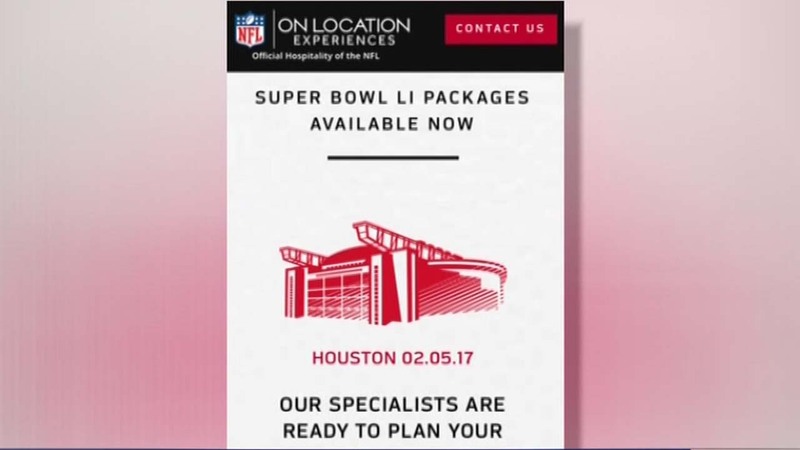 Ticket packages available for Super Bowl LI in Houston. HOUSTON (KTRK) -- Just 257 days until the National Football League's biggest game, Super Bowl LI, is played at NRG Stadium. "It's going to bring money to the city, it's going to bring jobs," said one football fan. Many Houstonians want the Texans in the Super Bowl while another passerby said, "Doesn't matter to me, as long as it ain't the Cowboys." How much would you pay for a ticket? Some sports fans would spend a lot of money. "How much would you pay for a ticket? Doesn't matter, I've got a good paying job so I wouldn't care." Another passerby said $2,000 if his team was in it. One man said he isn't a sports fan and added, "Zero money, I don't care." You might be able to lock in your seat soon. A vote of league owners Tuesday modified the allocation of Super Bowl tickets and gives "On Location Experiences", the official hospitality provider of the NFL, 6,000 additional tickets along with fan travel and hospitality packages. The tickets will come from the supply usually reserved for season tickets holders of the two teams playing in the game. The NFL assured fans this move will not make tickets harder to get for season ticket holders. Packages will be available starting in June with multiple price levels. "It gives the NFL a chance to offer more tickets to the public than they normally could," said Jack Stopnicki of Ticket Stop. The longtime Houston ticket broker says he doesn't know yet if he'll be searching to buy and resell any of the packages or how much they'll cost but adds the lowest he's seen the face value of a ticket at a recent Super Bowl was still $1,000. "There will be some fans that will get tickets at face value but that will be very limited, a few season ticket holders and there will be a lottery," said Stopnicki. For many fans it all depends on who is playing and who wants to go. "My wife would love to go," added one Houstonian. For more information, CLICK/TAP HERE.